The Grumman A-6 Intruder was an all-weather attack aircraft built by Grumman Aerospace from 1962–1990. With vastly upgraded navigation and attack systems, the A-6E was the definitive attack version, models totaled 445 aircraft, about 240 of which were converted from earlier A-6A/B/C models. 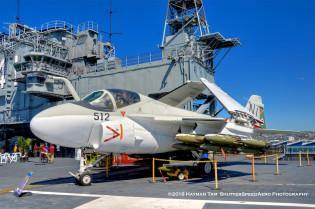 This example on the USS Midway flight deck carries a load of Mk-82 Snake Eye bombs under the wings. The A-6 was the US Navy/US Marine Corp’s primary asset for medium bomber duties until replaced by the F/A-18 Hornet in the 1990s. Nikon D7000 w/18-200mm.